Ever since I first began wearing makeup, eyeliner has always been a staple in my routine. It’s safe to say I’ve tried quite a few over the years but one of my main issues with every eyeliner I’ve tried has always been smudging and making sure it actually stays on all day. There’s some brands which come pretty close to what I want but I’ve always felt I haven’t found the perfect eyeliner. What I look for in an eyeliner is a waterproof formula which applies very easily on the waterline which doesn’t smudge or end up all over my face and I think I’ve finally found exactly what I’m looking for. Recently Anastasia Beverly Hills have come out with their Eye Covet Waterproof Eyeliner Set* which features 7 different shades of eyeliner and I can quite honestly say they're the most impressive eyeliners I've ever come across. I used to wear a bold black eyeliner on my waterline everyday but recently I’d been using a dark purple shaded eyeliner from Urban Decay so I’m not too scared about using coloured eyeliners. The Eye Cover Set has 7 shades which are all very dark which means they’re very wearable for everyday use and give a lovely hint of colour if you feel like trying something different, plus they’re perfect for this time of the year. I can’t say I’m a huge fan of the packaging design but it does make the eyeliners very accessible if you plan to keep them in the packaging. The eyeliners themselves are colour coded at the bottom and show exactly what the finish is like whether it’s a glitter based eyeliner or a metallic. You can buy the eyeliners individually too at £16 each but a few of the shades aren’t available to buy individually, plus considering the whole set is only £23, it’s an absolute steal. From what I can tell, the individual eyeliners bought separately are slightly bigger in size but both hold the same amount of product (0.4g), the only difference is that the set doesn’t come with sharpeners built in. 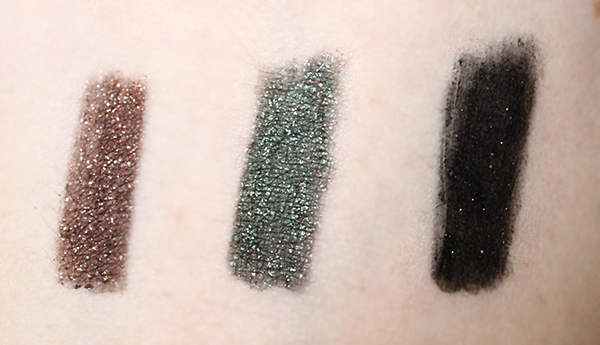 The shades featured in the set are L to R: Noir (classic black), Steel (warm grey), Guilded (shimmering golden brown), Azure (deep navy blue), Lavish (metallic golden bronze), Absynthe (shimmering grey green) and Midnight (shimmering inky black). While the first 4 shades are recommended for the waterline, Lavish, Absynthe and Midnight (below) are not due to their glitter formula which might irritate the eyes which is something to keep in mind. When I first swatched the shades onto my hand I was really impressed with the pigmentation and the variety of line widths I could achieve. Having quite small eyes means that I have to draw a very thin line so it makes a world of difference. The next thing that surprised me is the amazing staying power, this stuff doesn’t budge at all, even if you run your finger over it with a bit of pressure there’s absolutely no smudging. I decided my first test would be with Azure, the deep navy blue shade, which I applied directly on my waterline. I find that you do need to build up the colour as opposed to creamier eyeliners which go on very easily but it just means that the colour will stay on for much longer, and my goodness it did. This stuff lasted over 12 hours on my waterline. Yes, on my waterline people! It lasted through the wind and the rain without any sign of smudging which is quite impressive. With the amazing staying power does raise the question, how on earth am I going to get it off? Well lets just say you’ll need a pretty good makeup remover to remove this stuff. I eventually managed with some bioderma but I’d recommend something a little more oil based and heavier to do the job otherwise you might be sporting eyeliner for quite a few days! All in all, I’m so impressed with these eyeliners. I think the set is an amazing bargain at £23 considering the single eyeliners are £16 alone. So far I’ve had nothing but a great experience with Anastasia products, I also wrote about their Brow Wiz if you’d like to have a read about that too. 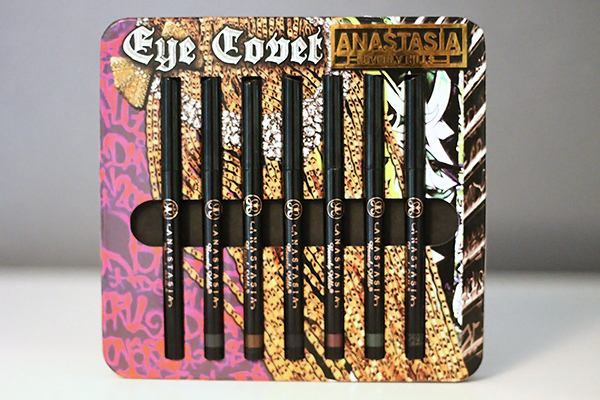 You can purchase the Anastasia Beverly Hills Eye Covet Waterproof Eyeliner Set at Cult Beauty.